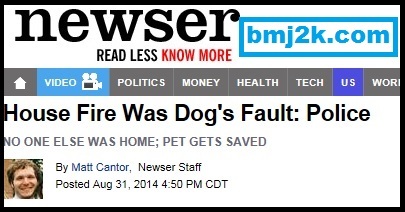 You’ve got to love Newser.com, that plucky little news site that no one cares about. No one makes it their homepage, no one goes there for breaking news, but they keep on putting their links out there, everywhere, on the theory that if they throw enough funny pictures in your face you’ll eventually click on something. It’s cute the way they try, like that little puppy that just can’t reach the top of the couch but keeps making those silly little hops in a vain attempt to reach the cushions. I’ve posted a couple other Snappy Answers to Newser headlines before (HERE and HERE, have fun, click away) and the response has been overwhelming. My great-aunt’s sewing circle, The Newkirk Needles, has sent me no less than three (!) glowing emails heaping praise upon the last installment. Check it out! Dear Great-Nephew. I received your latest posting of your blog called More Snappy Answers to Stupid Headlines. I read it. Regards. They love me! and here are three more headlines to love! Seriously? Isn’t this another variation of blaming your farts on the dog? Everything gets blamed on the dog. Who broke the lamp? The dog. Who spilled milk all over the living room rug? The dog. Who took Ambien, sleepwalked into the kitchen in the middle of the night, tried to broil a steak, then fell asleep on the kitchen floor and woke up late for work and rushed out the door, forgetting about the steak in the oven, and a few hours later the grease caught on fire and set the house ablaze? The dog. To quote Seinfeld, when Frank Costanza found himself in a similar back door predicament (The Fusilli Jerry): “It was a million to one shot, doc. Million to one.” When Oprah issued her No Cell Phone Challenge, I don’t recall getting anally penetrated being listed as one of the dangers of texting and driving. Because that would sure keep me from texting behind the wheel. And WHY don’t we have dinosaurs anymore? Because of punk kids like your son! Take that, Lady! PWNED! Somebody better read Ray Bradbury’s story “A Sound of Thunder” because it is about exactly that- a hunter kills a dinosaur. The Simpsons even did a parody of this! Sheesh, it is a good thing Ray Bradbury died in 2012 or he’d be under arrest today.